A 2.75ha white site in Woodlands Regional Centre has been released for sale. Analysts say the move by the Urban Redevelopment Authority is part of a government-led initiative to transform Woodlands into a commercial hub. The mixed-use plot, which is on the reserve list of the Government Land Sales programme for this half of the year, has a maximum permissible gross floor area (GFA) of 115,747 sq m.
At least 45,000 sq m will be set aside for offices. The rest can be for additional office, retail, entertainment and residential use. 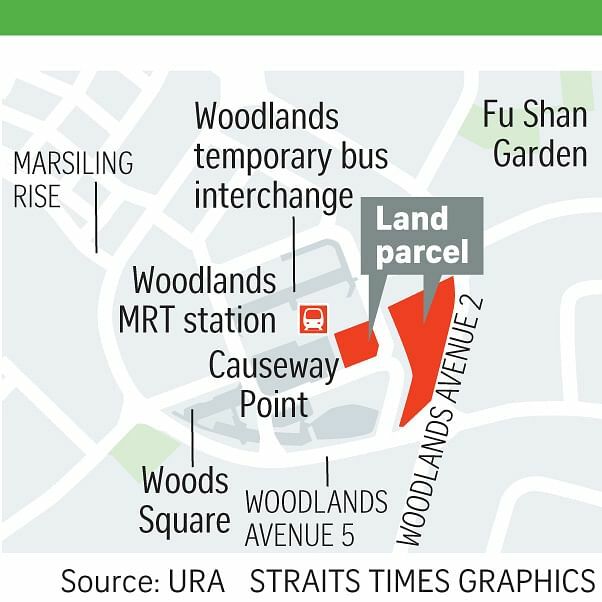 The land is in Woodlands Avenue 2 and will be directly connected to the Woodlands MRT station on the upcoming Thomson-East Coast Line and the existing North-South Line. It is the first white site to be put up for sale in the Woodlands Regional Centre area, which will be developed into a commercial hub over the next 15 years. A white site allows a range of uses, although the Government usually stipulates a minimum component of a specific use or specific uses to meet its planning intentions. The 100ha centre, which will comprise the commercial and community precinct Woodlands Central and mixed-use business cluster Woodlands North Coast, will eventually have about 700,000 sq m of commercial space and create jobs for some 100,000 people. Huttons Asia research head Lee Sze Teck said: "As this white site is on the reserve list, it gives the market the option of triggering it when the timing is right." The Ministry of National Development announced last week that the first-half 2019 reserve list will have a white site in Woodlands Avenue 2 for a mixed-use development. It noted: "This will help to sustain the development momentum of Woodlands Regional Centre as a major commercial node outside the city, in line with the Government's objective of bringing job opportunities closer to homes." Mr Lee said: "In the past, companies preferred to locate in the centre of Singapore for ease of business operations with clients, banks and government agencies, as well as the recruitment of workers. "But, with the relocation of government agencies out of the CBD and transport connectivity to all parts of the island improving over the years, a central location is seen as less important to some companies."